A cleanse is a reboot for your body and mind, it also gives you chance to check up and assess how you are feeling. Your decision on what to eat and drink can be a daily emotional response to dealing with stresses of life. A pres juice cleanse is a great way to temporarily give your body a much needed break from digesting complex foods. During a juice cleanse you drink only 100% unprocessed, cold pressed fruit and vegetable juices. By fasting in this way, you help your body to flush out any toxins from your system that have built up by consuming processed foods. 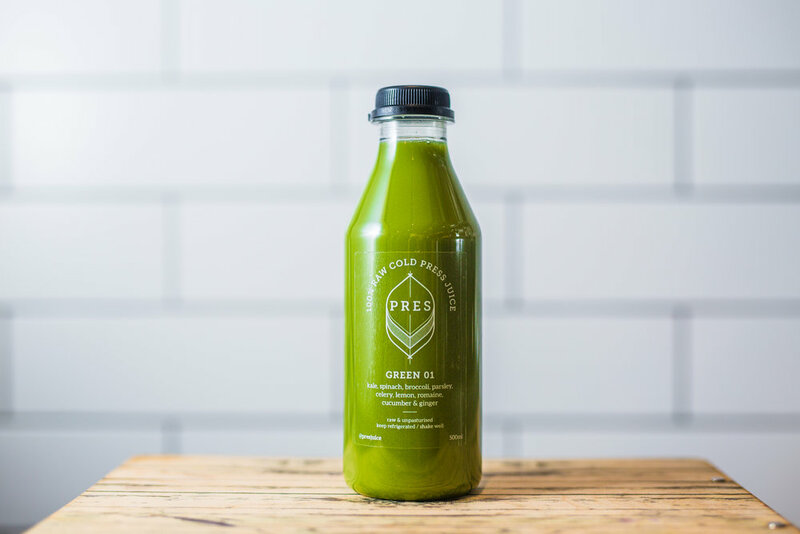 By drinking raw cold pressed juices, you’ll be replenishing your system with easy to digest liquid nutrition filled with living enzymes, vitamins and minerals. When you juice cleanse, you put the best nutrition into your body, you start getting rid of sick cells, you lose weight, get rid of inflammation, sickness and gain lots of energy. “I recently completed the five-day juice cleanse with Pres and can highly recommend it. I was able to collect the juices twice throughout the week, so I knew they were fresh and of a high quality. Pres include eight different drinks every day, a lot more than other companies I have looked at or purchased from. The cleanse starts with a charcoal lemonade and a ginger shot, which I chose to have first thing in the morning. There are then five (large) juices plus an alkaline water to drink throughout the day. I found that most days 3-4 juices were actually enough to fill me, and as such continued the cleanse for an additional two days with the leftover juices. I also added lots of water and green tea. The first day of the cleanse I had a headache. This was to be expected, as I had experienced this in other cleanses before, and was gone by day two. By the end of the week, I felt great! My skin looked brighter and breakouts had started to ease. I was sleeping better and can honestly say that I did not feel tired or lethargic at all, and had lots of energy to fuel my busy life. The juice cleanse fit in great with my lifestyle, as I don't have a set schedule and mixing a full-time masters degree with full time working hours, plus the gym and an attempt at a social life can be challenging. I actually found it easier than having to think about preparing healthy, fresh food. I will certainly complete this cleanse again and have already planned another two weeks before Christmas.